More than 450 industry professionals gathered last month in London to enjoy the International Awards for Powered Access (IAPAs) which celebrates the crème de la crème of the powered access industry. 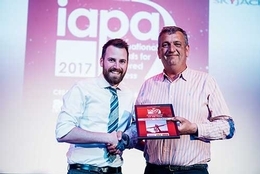 Jointly organised by Access International magazine and the International Powered Access IPAF, the IAPAs celebrate best practice and excellence across the sector. This year, Facelift sponsored the Access Photograph of the Year, which was won by Ed Darwin of Nationwide Platforms for his image Platform Inspecting a Gloster. The photo shows a Versalift platform donated by Nationwide inspecting a replica of the Gloster E28/39 aircraft, located close to Nationwide’s head office in Lutterworth and the first aircraft to use an engine designed by Frank Whittle, inventor of the turbojet. ← Unconscious Workman left dangling from an electricity pylon for more than an hour!